First a fall if you are rally interested in Active-X script task then only read this article ,Because it has not been use now a days !! Its has been used in 2000 its decade now still I feel like having post on same. All we use is script task !! But still as I have promised my reader to have an n to end knowledge about BI world I must explained it !! Why ActiveX Script Task is Use ? How ActiveX Script Task is look like ? 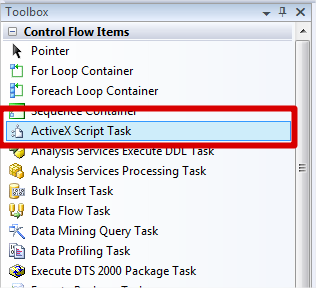 Comparing the ActiveX Script Task and the Script Task !! 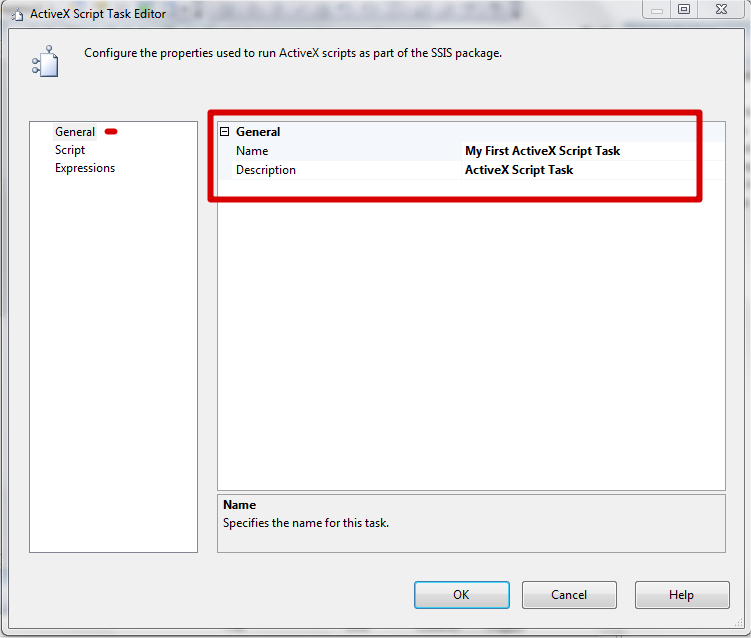 How to use ActiveX Script Task ? What is alternative For Each ActiveX Script Task ? Demonstration of using ActiveX Script Task ? Various Properties For each ActiveX Script Task ? The ActiveX Script task provides a way to continue to use custom code that was developed using ActiveX script, until such scripts can be upgraded to use the more advanced features provided by the Script task. Including business logic in packages. For example, ActiveX script can use conditional logic to manage package workflow. Writing functions that use conditional logic to set variable values. For example, an ActiveX script can access values in a database table by using ActiveX Data Objects (ADO) and populate variables with the table values. Performing complex computations. For example, an ActiveX script can compute new dates by applying built-in functions such DateAdd and DateDiff to data values. Accessing data using other technologies that are not supported by built-in connection types. For example, an ActiveX script can use Active Directory Service Interfaces (ADSI) to access and extract the user names from Active Directory. It just a 4th task in Tool Box !! Lets drag that out in our Development plane ! Provide the existing script that the task runs. Specify the scripting language that was used in the script. 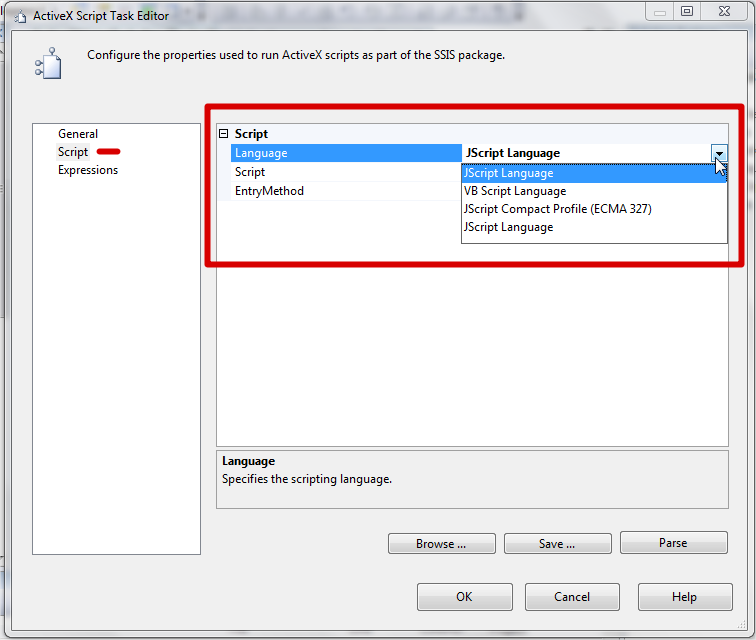 The ActiveX Script task supports the VBScript and JScript languages and other scripting languages installed on the local computer. 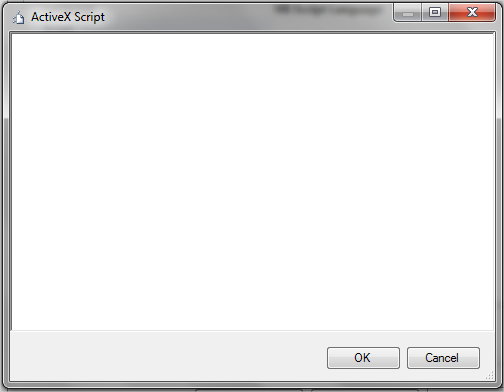 Specify the name of the function that is the entry point for the script. Scripts written in programming languages such as Microsoft Visual Basic .NET can be precompiled to deliver better performance. 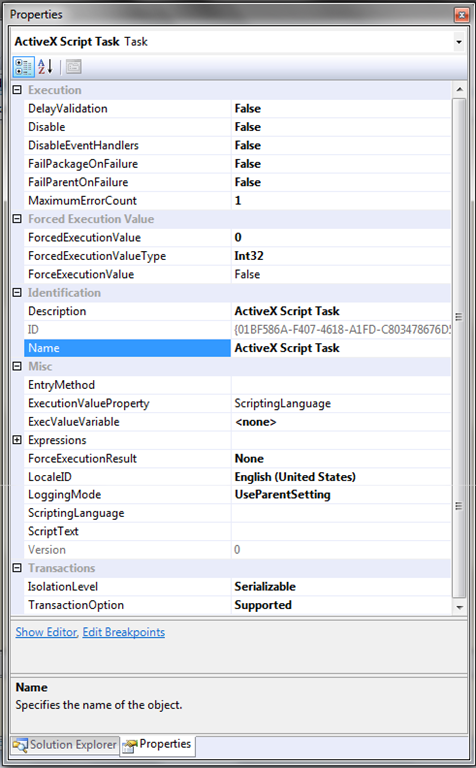 Scripts coded in the VSA environment are supported by integrated Help, IntelliSense, and debugging. Scripts can reference external .NET assemblies in addition to the standard .NET framework and COM objects. 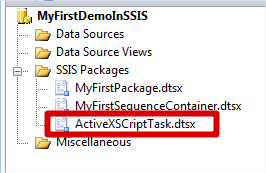 In this demonstration we are going to see on how to use ActiveX Script task container in SSIS packaging. Here we take some simple example of executing a VB Script at runtime using the ActiveX Script task container. This task container is mostly used on when we move the SQL 2000 DTS objects to SSIS packaging. So this task container is used to customize our process of writing script and executing those scripts at runtime. So just write any VB code inside it and execute it as you want.